This was a complex piece of land located at the confluence of Excelsior Blvd., Utica, Wooddale, and Vernon (Highway 100). It had belonged to Isadore V. Gedney, the pickle heir, from about 1926 to 1966. It is unclear what, if anything, Gedney did with the property. From 1935-1938 there was a Minneapolis Suburban Gas Booster Station on the site. In 1955 there were two mentions of what may have been this property in the City Council minutes. One attached a man named Andrus to it. Also, Constantine Ralles and George Santrizos had proposed to build a restaurant on the site in the spring but withdrew. Over half of the parcel was taken in 1966 for the redesign of the Highway 100/Excelsior Blvd. intersection. 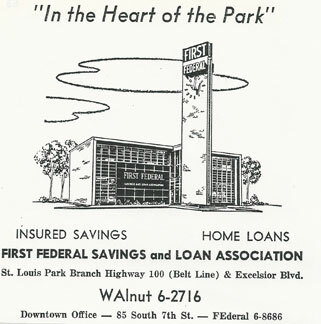 The First Federal Savings and Loan building was built at 5501 Excelsior Blvd. in 1955-56. 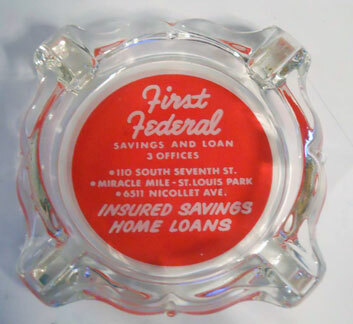 The bank, first organized in 1926, had been temporarily located in Miracle Mile until the building could be cleared by the Federal government. The Open House was held on June 4 – 8, 1956. Larson and McLaren were the architects of the unusual building that featured a 75 ft. tower and a prominent clock. 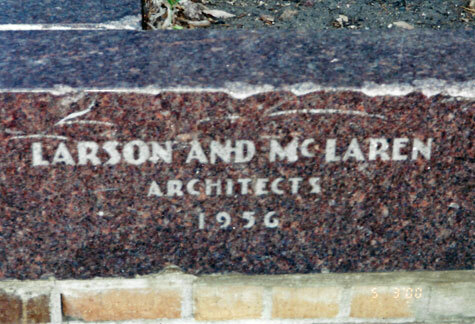 Photo from 1956 courtesy Minnesota Historical Society. 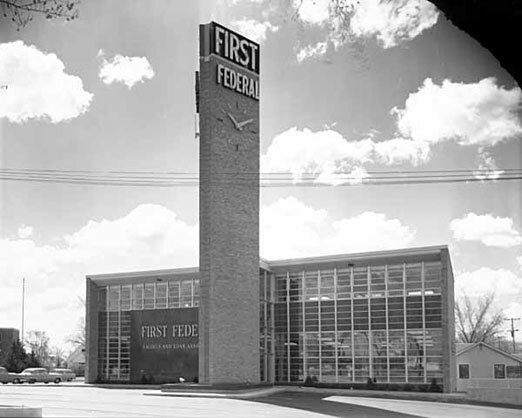 This 1964 ad (courtesy Jeff Lonto) shows that Richfield had a clock tower too. The following information comes from the book Fiasco at 1280 by Jeff R. Lonto (Studio Z-7 Publishing, 1998), Wikipedia, and the indomitable Alan Freed. In early 1990 WWTC/1280 radio was sold to Edina-based C.D. Broadcasting Corp., headed by Christopher T. Dahl, for $950,000. Dahl created an outlet for children’s music, specifically targeted at listeners of elementary school age. 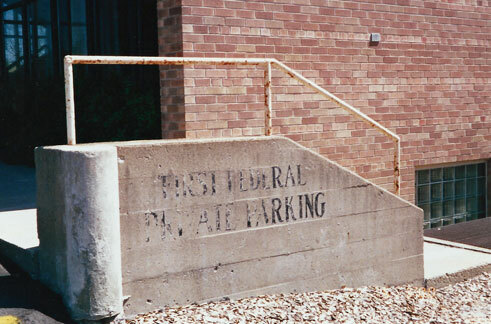 The station started broadcasting from Como Park on May 12, 1990, calling itself “The Educational Sensational Radio AAHS.” In October 1991 the station moved to the First Federal building from WWTC’s former quarters at 215 So. 11th Street in Minneapolis. The studio and operations were located on the first floor and the corporate headquarters on the second. There were plans to turn the old bank vault into a prize vault for contest winners but it was instead turned into a production studio and engineering area. The station was taken over by the Children’s Broadcasting Corporation by 1992 and Radio AAHS went national on October 25, 1992. Within two years it was heard in 40 cities, not all successfully. Although the station received good national press, it lost money each year. In December 1995 it was announced that Children’s Broadcasting Corp. had struck a deal with ABC Radio Networks to help fund the growth of the station and have the option to buy up to 20 percent of the company. ABC had just been acquired by the Walt Disney Corp a few months earlier, which seemed like a good thing. But eight months later ABC and Disney started their own radio network which would compete with Radio AAHS, and the news made CBC’s stock drop precipitously. Radio Disney premiered in the Twin Cities on the former KQRS-AM 1440 frequency in November 1996, originating from Dallas. 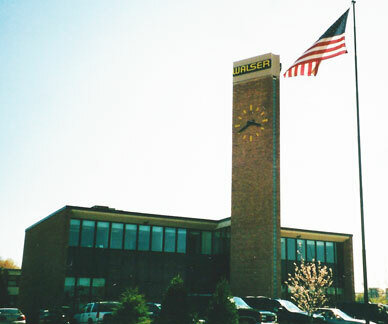 In 2001 the station was purchased by Salem, which moved it to Cliff Road and turned it into The Patriot. In 2002 Children’s Broadcasting won a lawsuit against Disney for $9.5 million in damages, with the judgment becoming final in 2004. 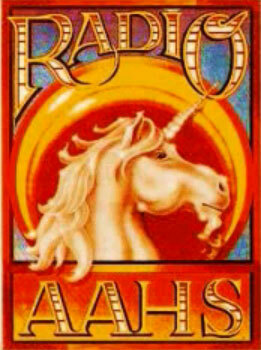 The assets of Radio AAHS were rolled into Intelefilm Corp. The business changed its focus to provision of digital services and products, but soon filed for Chapter 11 bankruptcy. The award of $12.4 million from Disney was used to pay creditors following liquidation of the insolvent company. 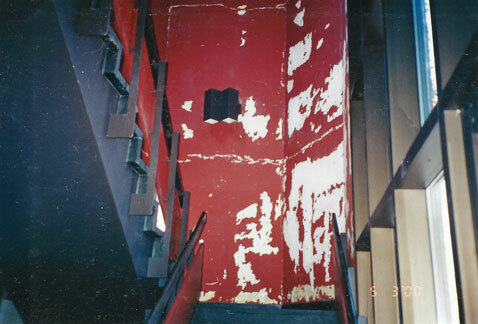 In 2000 the building was in a deteriorated condition, with its 1970s decor and peeling paint in the tower, which served as a staircase to the second floor. 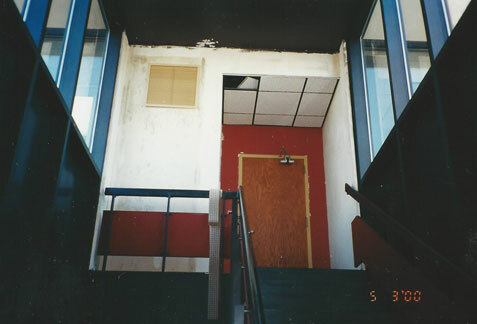 The four photos below were taken in May 2000; inside stairs, top of the tower, and remnants of the bank. In 2001 the building was purchased by Walser and the clock was restored. In 2006 the building became the home of Diversified Brokerage Services.